The Recipe: Is your rhubarb as pretty as can be this year? I can't get enough of it! Here's the rhubarb cake recipe I've been making for years and years, simple and rustic with "just enough" sugar and plenty of rhubarb. Enjoy! The Conversation: Choosing the right pan for baking "half a cake" when a recipe is written for a 9x13 pan. Less Sweet for Great "Rhubarb Sour"
When rhubarb comes round, I’m like a new kitten with fresh catnip, I can’t keep my paws off it! Missouri rhubarb is especially beautiful this year and this is a favorite way to show it off. The recipe is a forever-favorite, simple and rustic and for taste, less sweet too. So many rhubarb cakes are teeth-aching sweet. This one lets rhubarb’s great “sour” come through! Except for special occasions, a 9x13 cake is just too big around here. A piece or two, that’s all we need. So many times, I bake "half a cake" – adapting a 9x13 recipe for half a recipe. To bake half a 9x13 cake, what pan should you choose? Choose an 8x8 pan or a round 10-inch baking pan. Both have roughly half the surface area (64 square inches) of a 9x13 (117 square inches). The reverse works too. If your brownie recipe fits an 8x8 pan, double the recipe to fit a 9x13. Cool, eh? If you can, avoid a 9x9 pan, even though it “sounds” just an inch bigger. A 9x9 pan’s surface area is 81 square inches, that’s a full 20% bigger. That said, this Rhubarb Cake fits into a 9x9, the cake just isn’t as tall because it’s spread across 20% more surface area. Heat oven to 350F/175C. Spray a 9x13 pan (full recipe) or 8x8 or 10-inch round pan (half recipe). CAKE With an electric mixer, cream butter and sugar on medium speed until light and fluffy. Add the egg and combine well. Add the buttermilk and combine well. Add the flour and baking soda, mix in just until combined. With a spatula, turn in rhubarb. Transfer to baking pan. TOPPING Mix the sugar and cinnamon together in a small bowl. Sprinkle across the top. Insert a few pieces of rhubarb across the top. BAKE Bake for 30 – 35 minutes until the cake begins to pull away from the pan’s edges and a knife inserted in the center comes out clean. COOL Let cool until ready to serve. Keeps two to three days. WHAT'S WITH THE SUGAR? When updating this recipe, I discovered a discrepancy in the brown sugar amount. The recipe was originally published specifying 1-1/2 cups sugar (250g). The trouble is, 1-1/2 cups sugar is 300g not 250g ... and worse, I really don't know which one is right because I'm not finding the old cookbook the recipe came from. Luckily, it's almost rhubarb season, I'll figure it out ... until then, I'm publishing the range, 1-1/4 cups (250g) to 1-1/2 cups (300g). So sorry! ALANNA’s TIPS The extra pieces of rhubarb on top are all show-biz, just to tantalize people with color. But don’t be tempted to add more than 3 cups rhubarb, the cake gets too soggy. This cake calls for buttermilk, I use both grocery store buttermilk or Homemade Buttermilk. But I’ve also substituted both low-fat sour cream and low-fat Greek yogurt, thinned a bit with milk to match the consistency of buttermilk. To my taste, all all-purpose flour gives better texture in this Rhubarb Cake than 50% whole wheat or even 100% whole wheat pastry flour. I’m a broken record on this point: Penzeys Cake Spice and Baking Spice blends turn a good cake into a great cake. Just make a 1:1 substitute for cinnamon. Rhubarb Cake can go bad sitting on the counter so if it’s not eaten on the first day, cover and refrigerate. NUTRITION INFORMATION Per 32 (small) squares or 16 (larger) pieces: 98/196 Calories; 3/6g Tot Fat; 2/4g Sat Fat; 14/29mg Cholesterol; 71/142mg Sodium; 16/32g Carb; 1g Fiber; 9/19g Sugar; 1/3g Protein. WEIGHT WATCHERS POINTS WW Points 2/4 & PointsPlus 3/5 & SmartPoints 5/9 & Freestyle 5/9 Sorry, people. Weight Watchers says rhubarb isn't a freestyle "free" ingredient, a mistake in my mind. What's the difference between rhubarb and pumpkin? Both of them get used (mostly) in sweet things. This recipe has been "Alanna-sized" with reductions in fat and increases in color, nutrition and flavor from extra rhubarb and spices. Adapted from a circa 1980s Iowa church cookbook. Great tips on converting pan sizes! 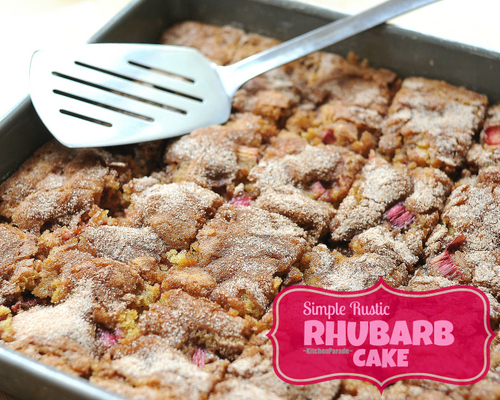 And a wonderful cake - rhubarb has terrific flavor, and I need all the new recipes I can find for it. We rarely bake rhubarb into a cake, but should - sounds great. Really excellent post - thanks. I love rhubarb too! This cake sounds fantastic! Love the cinnamon sugar topping. Thanks so much for the pan size conversion tips! I found a recipe calling for a boxed cake mix and an 11x9 inch pan, baked "according to the directions on the box". I couldn't find any boxed mixes that shared 11x9 inch directions, so I just used my 13x9 inch pan and followed those directions. I'm crossing my fingers that I'll get my hands on rhubarb this season. Thanks!